War, what is it good for? Absolutely nothing. Unless you’re a bunch of neo-conservatives and Trump. But oh no, this is all part of the plan to make America great again. Right? Cause there ain’t nothing like bringing Democracy (or life, liberty and the pursuit of happiness) through force of arms. Anyway, while coming up with this cartoon, I couldn’t help but think about how politicians absolutely LOVE talking about how they’re about to do something like raise taxes or bust some heads because…ya know, it’s for the kids. Movies you might enjoy after looking at this cartoon include Dr. Strangelove, and Con Air. The later pick is just cause it’s a cool flick, while Dr. Strangelove’s Major “King” Kong is a character to watch for if you want to know where a little of my inspiration for this illustration came from. Thoughts or suggestions on Syria, the Trump phenomenon, conservatives, progressives, the military industrial complex, or establishment media propaganda? Leave a comment! And if you’re the type that might enjoy a little humor over all the lunacy out there, then you’ll definitely want to check out our graphics page for even MORE of our exclusive libertarian political cartoons, art and infographics! Plus, don’t miss our great libertarian artist interviews as well! 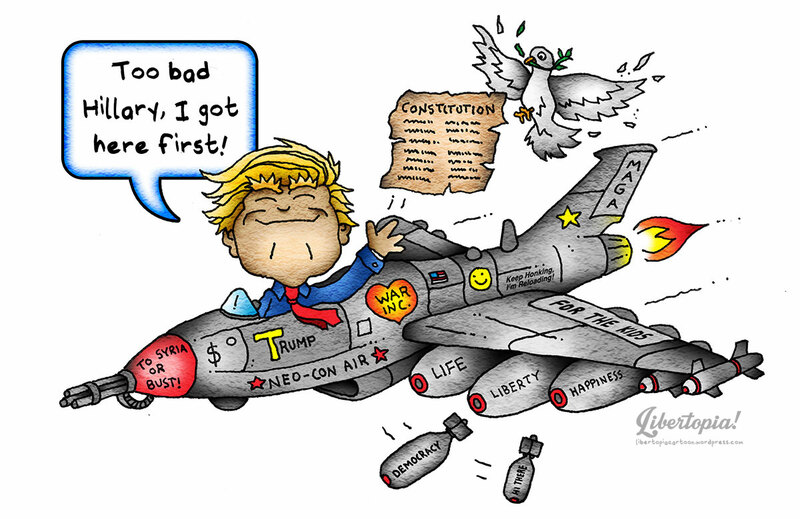 This entry was posted in Uncategorized and tagged con air, conservatives, Democracy, Dr. Strangelove, establishment media, for the kids, Libertarian, libertarian political cartoons, life liberty and the pursuit of happiness, Major King Kong, make america great again, military industrial complex, neo-conservatives, political cartoons, progressives, propaganda, syria, Trump phenomenon. Bookmark the permalink.